Pampering at a spa can come at a hefty price, but what many beauty fans don’t realize is that a number of popular treatments can be recreated at home at a fraction of the cost using store-bought ingredients like honey, olive oil, sugar, and even chocolate. Give these easy recipes a go! There are a number of skin benefits in both lemon and yogurt. Lemon contains alpha-hydroxy acids and vitamin C, both of which have healing properties that can help with acne scarring and inflammation. Yogurt contains lactic acid, which can help to remove dead skin cells and reverse the signs of aging. To make a facial mask, simply combine two tablespoons of yogurt with two drops of lemon juice and leave on for 20 minutes. Olive oil has been a staple among Mediterranean women for centuries as a moisturizer, as it contains rich antioxidants. Honey is a natural humectant, meaning it draws moisture from the air into the skin for great hydration. For a rich body-moisturizer, mix one tablespoon of honey with three tablespoons of olive oil and slather on your arms, knees, and body. Don’t settle for your usual bubble bath when it’s at-home spa day — treat yourself to a sensual rose and coconut concoction. While you’re running your bath, add a few drops of rose oil and a heaped tablespoon of coconut oil, both of which can be bought at pharmacies. Don’t eat all of the chocolate just yet! 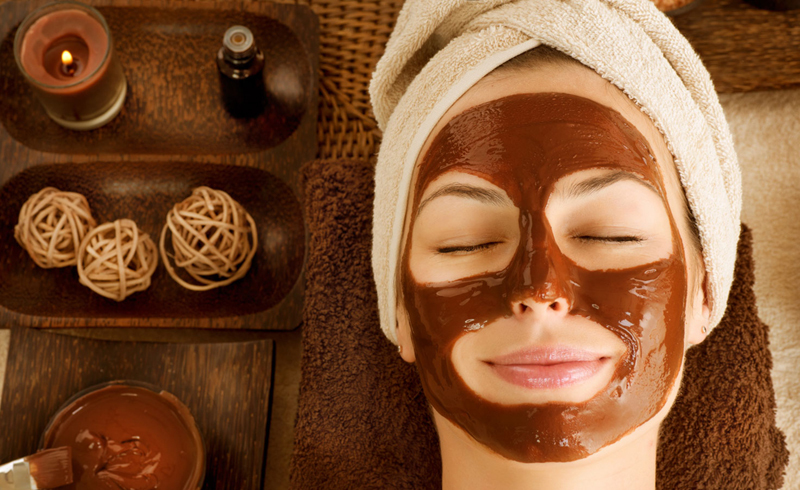 While it may be tempting, chocolate can be extremely hydrating for the skin as well as helping with toning and lifting. To make your own face mask, mix one tablespoon of melted chocolate with one tablespoon of thick cream and one tablespoon of honey. Apply to your face and neck for 15 minutes before rinsing with warm water. Olive oil isn’t just good for the skin — its ingredients are beneficial to both your hair and scalp. The antioxidants protect the hair follicles and the oil also penetrates the scalp and hair better than any other oil, resulting in shiny, healthy hair with improved elasticity. There’s no better way to get silky smooth lips than with a gentle scrub. It couldn’t be easier to whip up your own at home — just combine some Vaseline with a heap of brown sugar and rub over your lips before applying your usual balm. This type of vinegar can help restore your skin’s pH levels, which can soothe breakouts, prevent clogged pores, and stop skin from becoming either too dry or too oily. Simply mix one part apple-cider vinegar with two parts water and shake well. Apply to your clean face with a cotton pad. Follow with your usual moisturizer. This homemade scrub is both invigorating and nourishing, and can be used all over the body. Sugar is a humectant, which can help the skin retain moisture, and also contains glycolic acid, which can help encourage cell turnover and fresh-looking skin. Honey is also beneficial for the skin as it is a gentle ingredient that helps to remove dirt. To make the scrub, mix one cup of brown sugar with three tablespoons of honey. You can also add a tiny splash of olive oil and essential oil. Bath bombs look good and smell nice, but they can come at hefty prices. How about making your own? You will need one cup of baking soda, half a cup of citric acid, half cup of salt, one teaspoon of water, one teaspoon of essential oil, and three teaspoons of olive oil. Mix all of the dry ingredients in one bowl and all of the liquid ingredients in a separate bowl. Slowly mix together before shaping the mixture into your desired shapes and moulds — then let it dry. Stress and tiredness can lead to red, puffy eyes, and the simple use of tea bags can be effectively soothing. Chamomile, as well as green and black tea, are all anti-flammatory, with green and black tea also containing flammins that help reduce swelling. Simply soak two tea bags in boiled water before removing and placing in the fridge. Then place one bag over each eye and relax for 15 minutes.